Last night cellist Colin Carr, offered J.S. Bach’s Suites for Unaccompanied Cello Nos. 2 in D Minor, 4 in E-flat Major, and 6 in D Major, in riveting, fluid, tastefully understated performances at Seully Hall, Boston Conservatory as the opening of the seventh season of BoCo’s String Masters Series, in which a world-class string player gives a recital, followed the next day by a master class. Carr’s musicianship and technical skills are impeccable; he can throw off long complicated runs at a breakneck pace, with apparent effortless ease. Bach wrote comically abrupt shifts of register into the Cello Suites, most drastically in the Prelude of Suite no. 4 with its ongoing sequence of arpeggiated figures spanning two octaves. Carr negotiated every last one of them without losing the long line. And yet within that line, Carr inflects tempos, with the kind of flexibility of tempo that harkens back to Pablo Casals. The way Carr varies his phrasing and bowing helps to bring out the dance rhythms that inspired Bach’s music. And he played with a ravishing tone, harnessing his 1730 Gofriller instrument to bring forth ringing fifths and fourths when playing Bach’s various double and triple-stopped chords. It was also one of the cleanest solo Bach recitals I’ve ever heard; even cello deities like János Starker and Yo-Yo Ma let the occasional unplanned harmonic slip into their recitals. But last night, I heard Carr make no substantial mistakes in over an hour of solo playing, no mean feat in Suite No. 6, which was written for a hybrid instrument with a fifth string higher than the standard four strings, and thus has a lot of fast passagework at the challenging top of the register of a conventional cello. Carr played the highest notes with the same tonal security as the plunges down to the bottom of the register. Carr’s Olympian cello technique was deployed brilliantly to serve Bach with lucid clarity. Over and over again, I picked up connections between parallel movements in the three suites that I hadn’t noticed before. There was the gradual buildup of momentum in the Preludes towards a pregnant dominant-seventh chord, followed by a coda reminiscent of an organ improvisation. The dotted rhythms and open-fifth double stops gave the Sarabandes from Suites nos. 2 and 4 a similar stately grace. And the second Bourée of Suite no. 4 and the second Gavotte of Suite No. 6 play at aural illusion, with Carr fooling the listener into thinking that these movements are cello duets, even transforming into a hurdy-gurdy with its bagpipe-like ground in the Gavotte. The Gigues come across as genuine jigs, hopping in ebullient high spirits (reminding me of one friend’s likening of the Brandenburg Concertos to a yard of happy puppies). For the encore of the evening, the Sarabande from Suite No. 5 in C Minor, Carr played Bach’s deceptively simple un-harmonized line with naked artlessness. In some ways, Carr might be a little too artless and self-effacing. He took the stage in an “Early Music Formal” all-black outfit, and while his body and his face communicate all manner of information with a rich variety of grimaces and movements, the spare lighting, the spare costuming, and the music for solo cello all contributed to the feel of a monk in his cell at prayer. And in this most personal and exposed of music, he never milked a cadence, never paused to let a chord ring and reverberate before moving on to the next idea, lest it disrupt the momentum he had so carefully accumulated beforehand. I’m puzzled as to why a prodigious player like this doesn’t have a bigger following, and I wonder if the lack of ostentatious razzle-dazzle keeps him from reaching a wider audience. But in his understated, minutely observed way, Carr reminded me why I chose to settle in Boston. 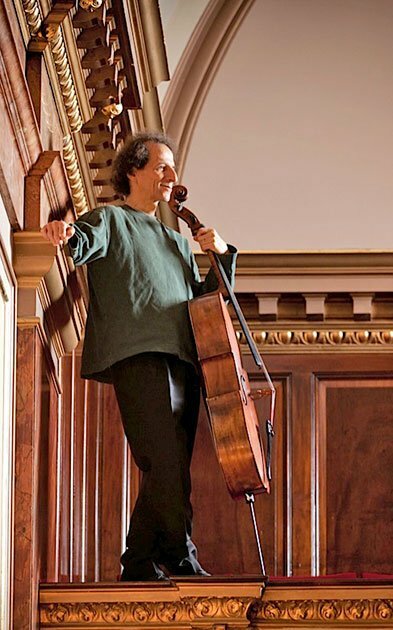 Where else can you hear a master play three Bach cello suites so meticulously and musically, in the intimate but resonant acoustic of Seully Hall, one year and a masterful performance of all-six in one span at Jordan Hall by Lawrence Lesser the year before—both free? And there’s more to be had; Carr will present a masterclass to BoCo cell students on Monday in Studio 401 of the Musical Theatre building (31 Hemenway Street) from 7-9 p.m.; this event is free and open to the public. Boston Conservatory’s concert series will continue with faculty recitals (mezzo-soprano Pamela Dellal on Saturday, September 20 and flutist Sarah Brady on September 21), a Piano Masters Series recital with Awadagin Pratt on Tuesday, September 30, and violist and Curtis Institute President Roberto Díaz in another String Masters Series recital on Sunday, October 19th. Details, as usual, can be found here https://www.classical-scene.com/calendar/. One should also not neglect BoCo’s Piano Masters Series which begins with Awadagin Pratt’s recital on Setember 30th in Seully Hall.